With this year almost coming to its end, it's time for the crypto world to start totting up the results. The previous year of 2017, was marked by the market hitting a boom in terms of ICO projects collecting an unprecedented amounts of money. But what is happening with the projects that raised the most cash right now you may wonder? Did the investors’ hopes come through? Today, we will review the current status of 5 ICOs that managed to collect the largest sums in 2017. The blockchain data storage network Filecoin began a public token sale on August 10, 2017 and in 11 days collected $257 million, and also received funding from major venture capital investors such as Y Combinator, Naval Ravikant, Andreessen Horowitz and Winklevoss Capital. According to the team, Filecoin will be a decentralized data warehouse that will compete with Amazon Cloud, Google Drive and Dropbox, stating that the solutions of IT giants have a centralized nature and therefore are more vulnerable to cyber attacks. Retrieval Nodes - type of nodes that makes the Filecoin network architecture unique. They should be located as close as possible to the Storage Nodes, have high capacity and good speed. Nodes holders are rewarded if they first find and upload a file when a user requests it. Filecoin’s ICO was available only to the accredited investors, that is tokens couldn’t be purchased anonymously (as happens with most ICOs) and participants should had significant savings. Tokens were sold using the SAFT (Simple Agreement for Future Tokens) model. This means that the buyers didn’t acquire tokens, but a contract for their receipt as soon as the Filecoin blockchain launches. In the fourth quarter of 2018 the GitHub repository will become public, which will allow third-party developers to participate in the development of the project. The launch of the test network is scheduled for the beginning of 2019. Filecoin representatives stressed that the deadlines may change. Thus, it’s impossible to assess the pace of project development due to its absence, but we can only say that the team works systematically and regularly publishes information about their successes. Smart position, isn’t it? 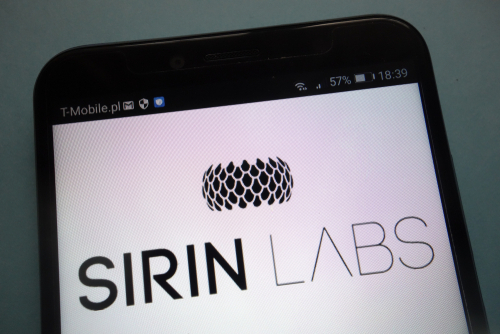 Sirin Labs is an Israeli company engaged in development of a blockchain-backed smartphones FINNEY. Back in June 2016 the company introduced a SOLARIN smartphone with a price tag of $13,800. In 2017 the production of SOLARIN folded down. But this didn’t prevent the company from attracting almost $158 million during an ICO in December 2017. According to the statements of the team, FINNEY devices are the first mobile phones and computers with a blockchain-backed cyber security system. 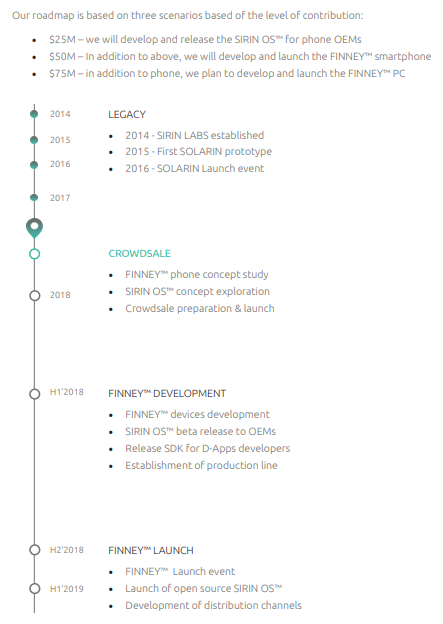 FINNEY devices form an independent blockchain network with a compact and scalable architecture, based on the IOTA Tangle technology and SIRIN LABS security ecosystem. According to the roadmap, the company planned to collect $75 million as per the most optimistic forecast and spend it on setting up mass production of smartphones in 2018. However, after the ICO, market capitalization of tokens collapsed by almost ten times. Thus, the investor losses amounted to approximately $141 million. Now, according to the coinmarketcup.com, it now comes to just $19 million. But despite the financial losses the company announced that the first smartphone would be presented to the public by the company's ambassador, football player Lionel Messi on November 28, 2018 in Barcelona. Sales will start on December 15, 2018. Despite a huge loss and disappointment to investors, the project team looks like will be able to realize their intentions and launch the product. Then, everything will depend on how popular those smartphones become. On June 12, 2017, the Bancor project raised $153 million over three hours of ICO. The main idea of the project is to make smart tokens a legal currency, and create a standard that will link all cryptocurrencies in an autonomous decentralized network. According to the roadmap of the project after the successful token sale the team planned to activate smart contracts by the end of 2017, launch the platform and apps, and in 2018 launch a wallet and a cryptocurrency exchange for fiat money. The project has set about ticking off the tasks it has planned to complete. So, after 6 months, the co-founder of Bancor Galia Benartzi has compiled a report on what has been achieved. More than 50 token projects have already joined the Bancor network. In addition to BNT (Bancor Network Token), the app supports ETH, GNO, ENJ, BMC, IND, STX, WISH, IQT. Galia Benartzi noted that in 2018 Bancor will focus on scalability in order to integrate thousands of tokens into the network and allow millions of users to easily manage their tokens with automatic calculation of prices at small fees. The main technological innovation in the upcoming year is a cross-blockchain support, and the main product is its own tokens that each user can easily create. But the project didn’t avoid unpleasant incidents: in July 2018 hackers stole about $12 million in Ethereum, $1 million in Pundi X tokens and $10 million in BNT cryptocurrency. The project team noted that user funds were safe. The stolen Bancor tokens were frozen using a special system which prevents attackers from selling on the coins. Recently Bancor has revealed that it has a market capitalization of $85.7 million, which is significantly less than what was collected during the ICO. But, the project is optimistic and openly announces each step of its development, which gives investors hope for profit in the future. 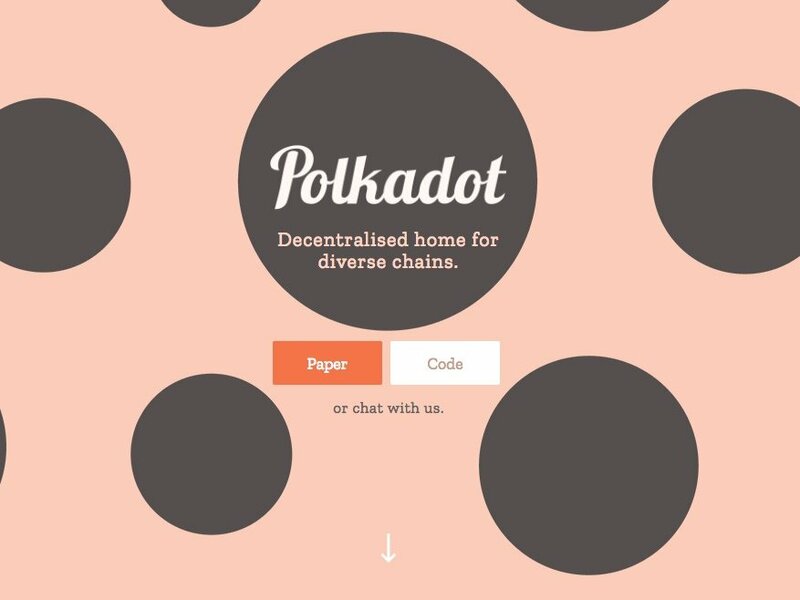 Polkadot is a platform that allows for cooperation between different blockchain systems which does it through the creation of individualized sidechains for them. Thanks to the Polkadot project, various blockchain systems are able to facilitate the secure sending and receiving of messages between themselves without the need to gain trust. The protocol was developed by the co-founder of ethereum Gavin Wood and collected $144.3 million during its ICO in October 2017. The Polkadot project is being carried out by the Swiss Web3 Foundation. According to whitepaper and the roadmap, all ICO participants will receive their tokens after the Genesis block is launched in 2019. But, Polkadot seems to be a very controversial project. On one hand the idea is excellent and takes the blockchain technology to the next level. But on the other, all invested funds remain frozen for two years, and who knows what might happen in that time. In May, 2018 Gavin Woods announced that the project will soon launch the first proof of the Polkadot (PoC) concept. But still no one can change the fact that funds are already invested and tokens will appear only in 2019. We only need to wait. The Web3 Foundation attracted Parity Technologies for the implementation of the Polkadot protocol. Currently these works are at the stage of execution. The launch of the Polkadot primary block is expected to take place in third quarter of 2019. Qash cryptocurrency is a specially created digital currency that is used as a payment tool on the Liquid platform. During the three-day ICO in November 2017, the company raised $105 million by selling its tokens, which it promised to use for the Liquid platform development. QASH utility tokens will be used on the platform, allowing users to access its services. 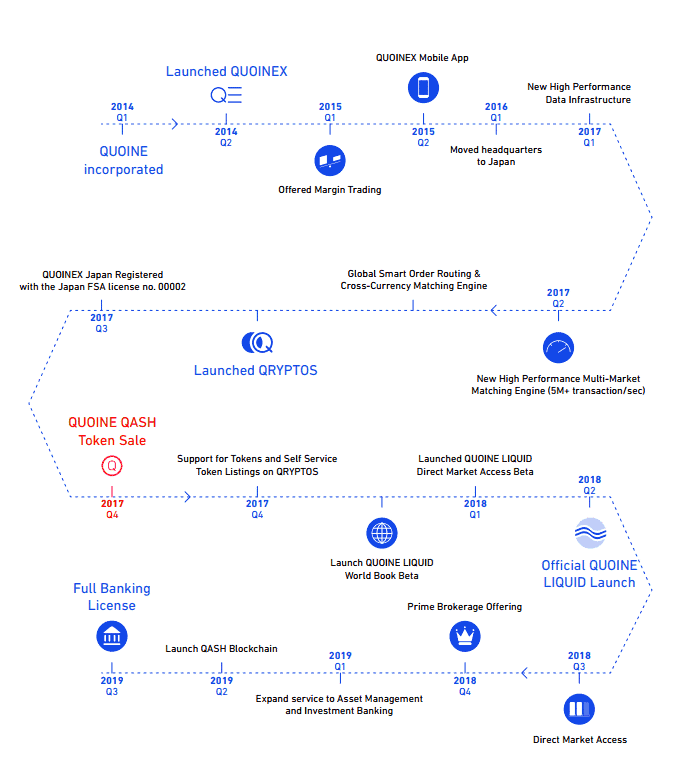 Singapore's Quoine project has a four-year history, during which several exchange sites were created. The roadmap shows the most serious intention of the team to move forward with the project. By the end of 2018 the direct access to the financial market will be created and the Prime Brokerage option implemented. In 2019 it’s planned to add additional management tools, launch a separate blockchain and get an extended license on its activities. At the end of August 2018 the project announced that they had officially merged with their former crypto exchanges - Quionex and Qryptos into a single new exchange named Liquid. As part of the Liquid rollout, Qryptos and Quoinex will be merged. If you have an account on each exchange they will become one account on Liquid, if they share the same ID. If they do not, and you would like them merged, please contact support. However, the project still is unable to keep up with the roadmap. Reddit users criticize the project, stating that they can barely get the latest version of airdrop. Despite the fact that the project presented its official joint exchange platform, it still hasn’t made any big step. The low volume of exchange, stability problems and the lack of a clear roadmap (banking license in the third quarter of 2019 and Qash blockchain in the second quarter of 2019) are not good signs for the community. In this regard, investors have to be patient and wait for the team to carry out the tasks. But despite the displeasure of users, Qash currency shows good stability in the market and even some growth against the general fall in prices. Now Qash market capitalization is $78.2 million, although only 35% of issued tokens are in circulation. That is a very good signal.